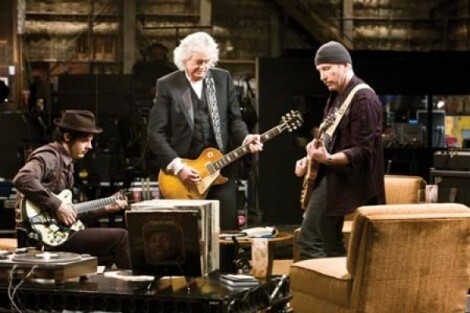 Amp Counselors: Jimmy Page, The Edge and Jack White should let the guitars talk. In An Inconvenient Truth, director Davis Guggenheim managed to portray Al Gore with the charisma of a rock star. So perhaps there’s symmetry to the fact that in Guggenheim’s followup documentary It Might Get Loud, he portrays rock stars with the charisma of Al Gore. All right, that’s a cheap shot, and not entirely true. Of the three subjects profiled in this look at the art of the electric guitar—Led Zeppelin’s Jimmy Page, U2’s The Edge and The White Stripes/Raconteurs’ Jack White—only White is actually a frontman. And not surprisingly, he also provides the liveliest commentary and weirdest insights, including a contrarian rejection of technology’s contributions to music production. Page and The Edge—more accustomed to ceding the spotlight to lead singers with star power—don’t seem to know what to do with someone showing interest in them. But Guggenheim is to blame for burying his lead. The hook for It Might Get Loud is a January 2008 “summit” in which the three generations of guitarists got together to talk about their musical ideas, and maybe to jam a little. When the film actually does spend time on their interaction, it’s pretty cool stuff. The Edge tutors Page and White on how to duplicate the chiming chords of “I Will Follow.” Page humbly declines to add his voice to harmonies as they play The Band’s “The Weight.” When they’re communicating with each other, verbally or musically, they have plenty to say. That material, however, seems to take up token minutes in a film that otherwise spends most of its time following its subjects around to old haunts, or listening to them ramble on about that most predictable of music-interview subjects, their “influences.” Every rocking piece of performance footage makes the visits to The Edge’s Dublin school or White’s Detroit hometown that much less interesting by comparison. When we’re around these guys, we want to hear their guitars do the talking.